If you use your living room as both a media room and for entertaining you probably know the struggle of having the right lighting. Check out our recent project of easy DIY Customizable Media Room Lighting. One thing I love doing this time of year after I’m done spring cleaning is to give some rooms a refresh. I don’t like doing major renovations or anything due to the time and cost, but there are a lot of ways to give a room a makeover without much cost or time thankfully. One room that has been nagging me a bit lately is our living room. One reason we actually chose this house is because we loved how the first floor was really open. The living room was also on the larger side, making it big enough to use as a media room of sorts when we wanted, but also work for entertaining guests as we like to have friends over to watch sports events, movies, etc. However, it has been a struggle to light. We put up blackout curtains that help a ton for watching our big screen TV, but when we have friends over to watch something and have appetizers, we wanted enough light to be able to see everything and everyone. Insert my recent DIY customizable media room lighting project. You might think this is daylight but it’s actually a strip of flexible lights giving off bright white light. There were two main factors I was looking for when looking for customizable lighting for our media/living room. First, I wanted it to be affordable and easy for us to install ourselves. 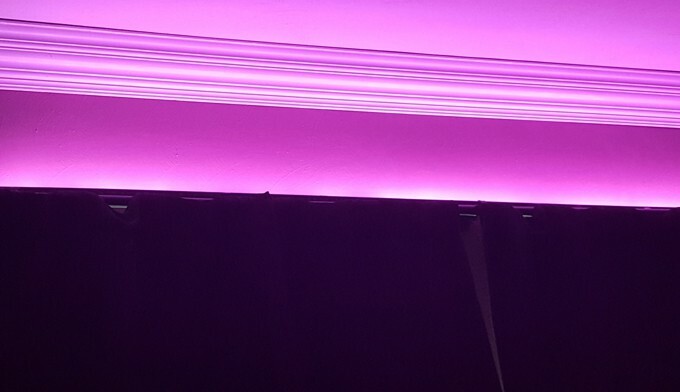 I also wanted dimmable lights, and preferably be able to change the color, so that we could have the brightness we wanted in a variety of entertaining situations. I’ve been mulling over different products for several months now, so when I was invited to try out a couple LIGHTIFY products I thought it was a great time to see what we could come up with. Here’s some information about LIGHTIFY. This is how our living room looked before. The curtains did a great job of blocking out the harsh light. Sometimes that was too dark for entertaining, though. 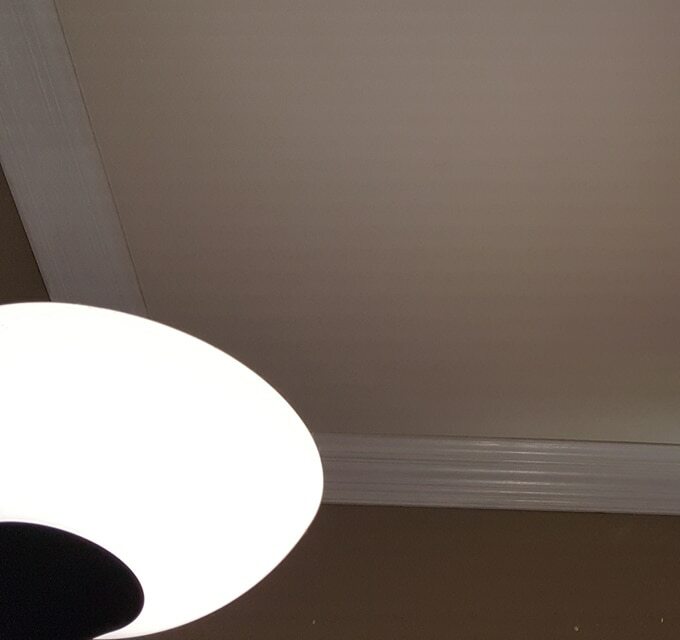 Our current lighting included a ceiling fan with 4 bulbs that were very yellow and often just too much light. So, we added in a lamp behind the couch with a bright white light. It was okay, but the light didn’t go very far and we could never agree whether to keep the light on or not. Plus, it caused glare on the TV. So, I really liked that LIGHTIFY had dimmable bulbs and flexible light strips that could be dimmed and even change colors. So, we added a bright white lamp that was nice for during the day. But at night when wanting to see what we ate while watching a movie, it was a bit too bright. 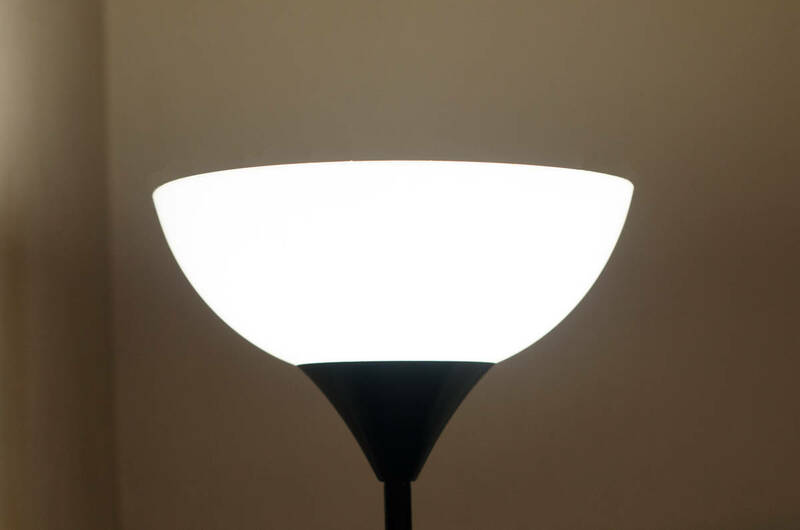 I first wanted to try out one of the light bulbs in our lamp since it would be the quickest and easiest to install. I first installed the gateway, which is pretty easy to do. It’s kind of like a hub that all your lights and bulbs connect to and the gateway connects to your wireless router so that you can control your lights no matter where you are. You first download the LIGHTIFY app, create your account, and then go through the steps to setup. There’re only about 5 steps and the app takes care of the rest. I did have to go through setup twice as it didn’t work the first time, but I haven’t had any problems since. 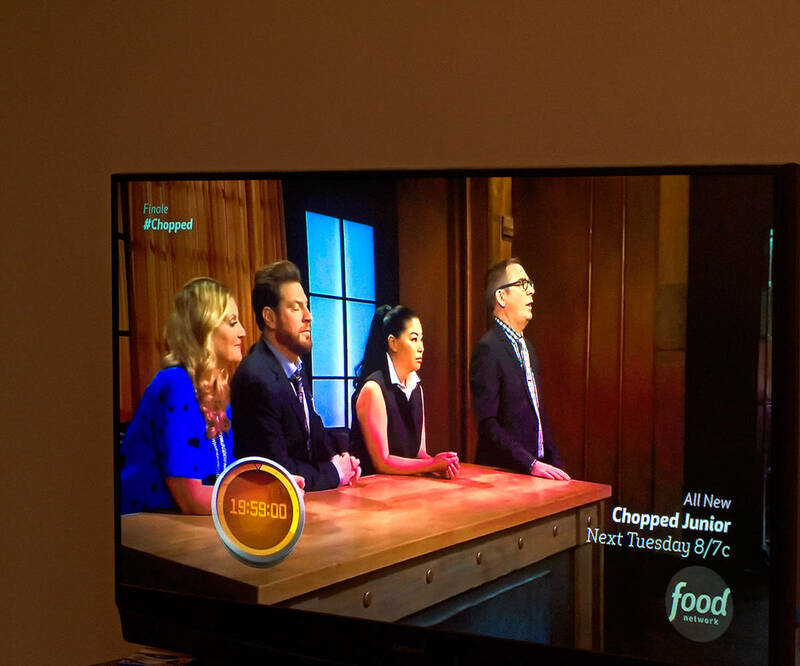 And would sometimes add glare to our TV. The light bulb was easy to install. 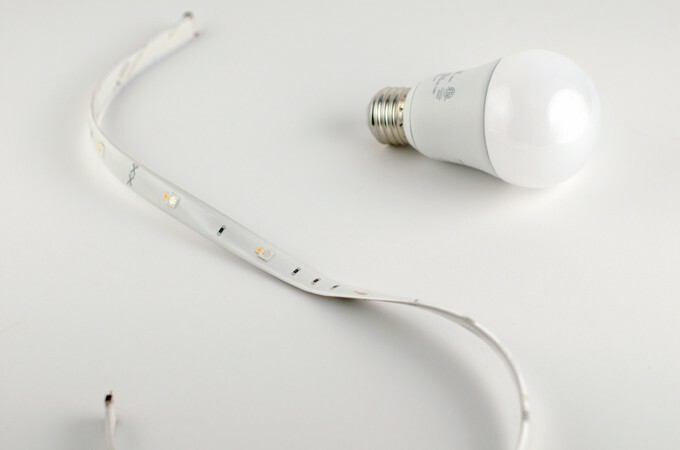 Take out the old one, put in the LIGHTIFY bulb, and go through the simple steps in the app to get it connected. Then I could immediately use the app to turn the light on or off and adjust the light. I really like that as you adjust the settings in the app, you immediately see the change in the light instead of having to save the setting and waiting a few seconds for it to process like some other products with similar technology. 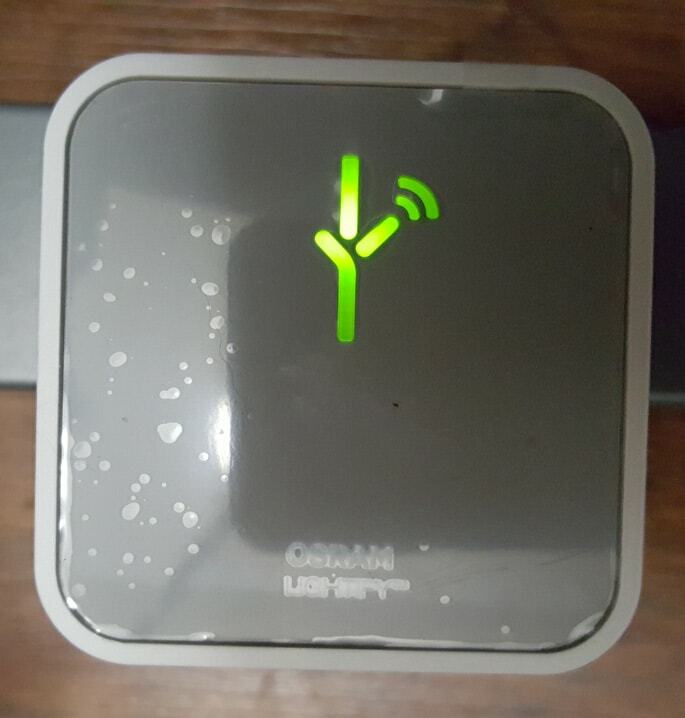 This is the LIGHTIFY gateway all your LIGHTIFY products will connect to so you can adjust them through the app. For the flexible light strips, I wanted to do something a bit different. 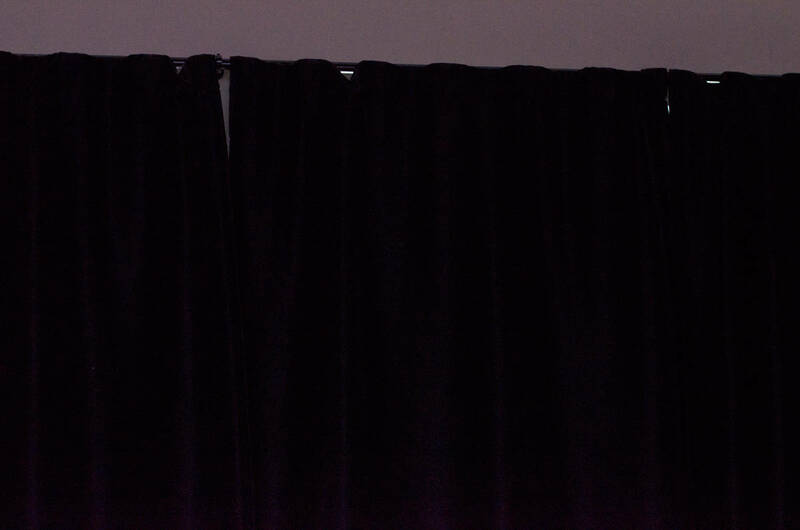 The blackout curtains that we use are great, but a bit of light does come in through the top. So, I had an idea to get a long thin piece of wood to place on top of the curtain rod. 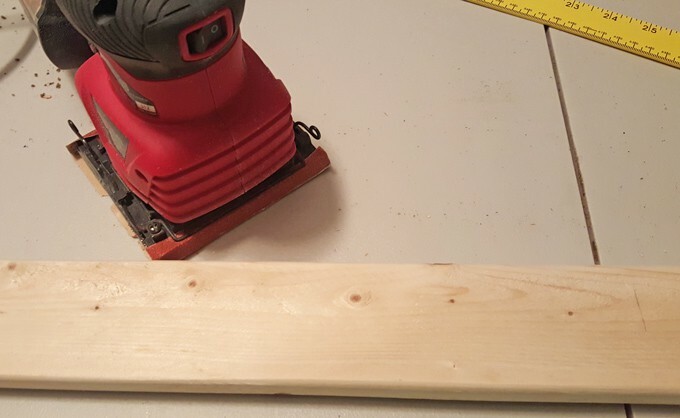 The wood was very cheap, under $3 at our local home improvement store and about 1″ x 3″ x 8′. Since I had 3 strips of 2′ of lights, I cut down the wood to about 76 inches, or 6 feet with 2 inches on each side of the light. Then I sanded the wood down until it was smooth, brushed it off, and gave it a coat of black paint so that the color wouldn’t stick out above the curtains. After it dried overnight, I sanded out any rough spots that came up and applied another 2 coats of paint and I was satisfied with the color. We painted ours black so it would match the curtains and not stick out. You can also see the scissor marks that make it easy to know where to cut if you need a shorter length. After the paint was thoroughly dried I connected all the lights to the power supply and temporarily taped them down with scotch tape to make sure of the spacing and that they worked. 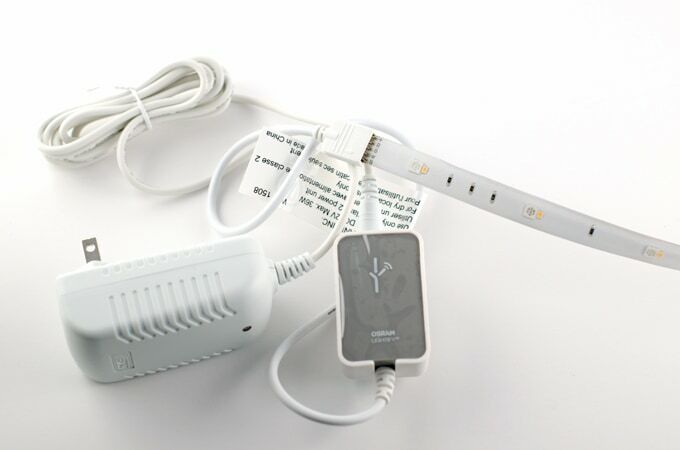 Note that there are letters on both the strips and the power supply that must match up when you connect them. Then I removed the tape, and then took off the backing to the lights and stuck them onto the wood. It’s important to note that you are very careful when you do this because it is a permanent placement. After everything was in place, we put the wood with the lights facing up above the curtains, sitting on the curtain rod supports. We plan to secure the board to the wall eventually but wanted to make sure we liked the placement first. And that’s also the nice thing about putting the lights up this way because it’s a very apartment-friendly lighting solution. They can be moved around easily, and you can also take them with you if you’re renting or living at a place short-term. So far we’re really loving the LIGHTIFY lights. 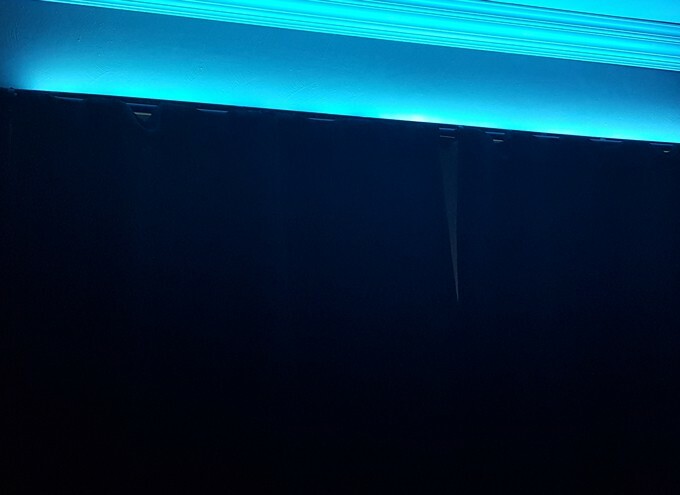 I love that during the day I can put the lights on a bright white if I’m working on the laptop on the couch to be comfortable and not feel like I should be going to bed soon because it’s dark. It’s also nice that we can have a nice low blue light during the evening while catching up on TV so I can still see and Mr. Savvy isn’t bothered because it’s not super bright and distracting. I think it’s so cool that I can change the brightness and color of the lights without even having to get up. There are also various presets you can use to automatically change the color of the lights throughout the day. I LOVE that you can have so many colors of lighting. If you’d like to give LIGTIFY products a try, they are very affordable and available at both Amazon and Lowes AND you can enter to win a LIGHTIFY starter kit of your own and a $50 Amazon gift card below. 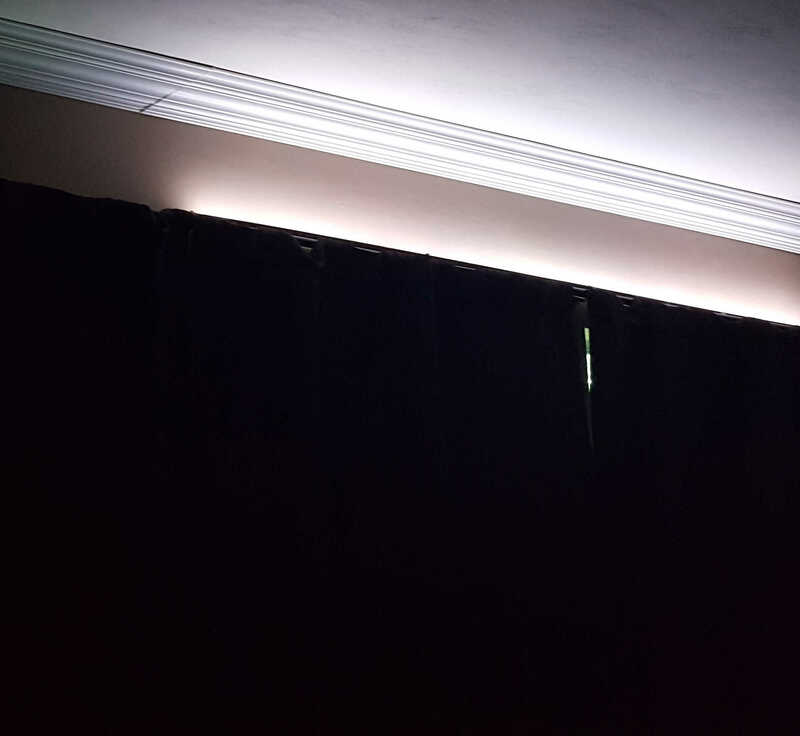 I already plan on getting more of the flexible light strips because they are just so neat to use and actually give off a good bit of light (or you can adjust them for just a little bit of light), plus there are some outdoor lights that I’d love to try. I also like the lamp bulbs because I can dim the light for later in the evening but have it bright while working. The app is also super easy to use. 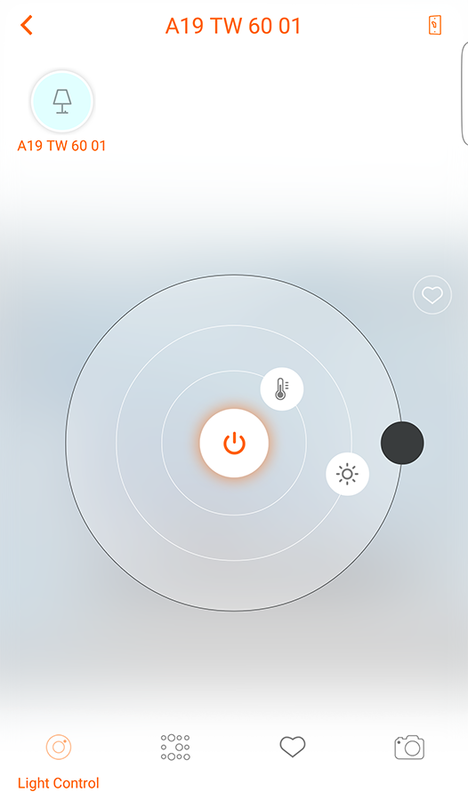 Just tap, hold, and move the circles to your desired settings. This giveaway has now concluded. Congrats to our winner, Gina. I would like it in my kitchen. I would love them for my bathroom. I would love these lights in my craft room. I would love to customize lighting in my living room. Right now it’s either too dark or super harsh. It’s quite unflattering.